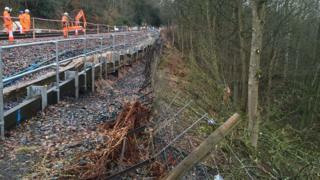 Network Rail has begun a £23m project to repair the line at Armathwaite which was damaged following heavy rain. The scheme will see hundreds of concrete-filled steel piles driven into the surrounding bedrock in the hope of preventing further landslides. Network Rail has apologised for "continued disruption" to passengers. Engineers will build a steel, tunnel-like structure that will sit beneath the railway, 230ft (70m) above the nearby River Eden, to provide a stable base across the damaged ground. Two rows of high-strength piles will then be driven into the sloping bedrock to form a corridor on which a 100 metre-long concrete slab will be placed to provide a base for new tracks. Since February the line, which handles about 1.3m passenger journeys a year, has been shut, initially between Appleby and Carlisle,, Northern services began running as far as Armathwaite in June, with buses between Armathwaite and Carlisle. A Network Rail spokesman said: "The work we are carrying out will safeguard this section of railway for generations to come. "We recognise the impact the closure has had on local communities, especially during the summer tourist season, but we would remind people that the Settle-Carlisle Line remains very much open for business." David Sidebottom, passenger director of Transport Focus, said: "This isn't your traditional commuter line. It is very popular with tourists so there need to be measures in place to make sure passengers get the right information and the right help. "Most passengers will accept this as an act of God, but service providers need to work closely with the tourist industry to ensure inconvenienced passengers are treated appropriately." Douglas Hodgins, chairman of Friends of Settle-to-Carlisle Line, said: "We have been working closely with Network Rail and Northern to get the best of outcomes to what could have been a catastrophic event for the line's present and future. "The enormity of the repair task cannot be overstated."